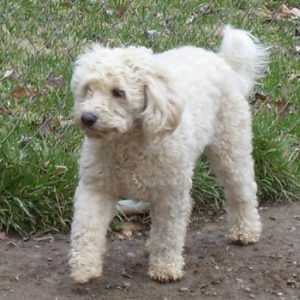 The Woodles are a breed of mixed dogs having the Poodle and the Welsh Terrier as parents. They are non-aggressive dogs, with a calm and friendly nature, affectionate towards people and getting along quite well with other dogs and children. They love to play and are pretty active animals. The Woodles’ coats are usually curly, with long, thick hairs and come mostly in solid white color. Being the barking and also the alert type of dogs, the Woodles notify people when they feel or notice something strange nearby. They do make excellent family dogs, with some watchdog abilities, as they sometimes manifest protectively. Woodles generally shed very little, but they do need regular brushing and grooming. This will ensure their coats keep a clean and shiny look. Bathing is required only occasionally, when the hygiene level is in danger of dropping. Their intelligence makes the Woodles easily trainable although they have sometimes a problem with obedience, but this process does however require a lot of patience and consistence, along with firm, but not harsh handling. 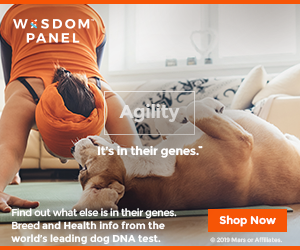 This breed is highly energetic and active, thus needing daily exercising and playtime in order to burn the energy reserves. They can adapt to apartments provided required exercise level is achieved, but they do best in yards where they can run and play. The Welsh Terrier is a confident and charming dog, independent and curious in nature. This medium sized, sturdy dog takes care of rodent problems. Anyone would recognize this dog as being a terrier by the ears which are folded down and the tail kept straight up. The Welsh Terrier is no exception from the rest of the terriers when it comes to not doing well with other dogs, chasing other smaller pets like cats or digging all around the backyard. But despite these things which can be not welcome by some, the Welsh Terriers are no victims of boredom and will always entertain through their behavior. This terrier usually weighs no more than 10 kilos. Although cute and charming as a puppy, the stubbornness can turn him into a tyrant later on if spoiled too much. On the other hand, lack of affection can affect him, so one needs to find a balance between these aspects. Due to his high levels of energy, a proper training started at an early age is highly recommended for this terrier (and for all terriers for that matter), otherwise he will find his own means of using them, be it by digging all around or chasing other animals. This would also prevent excessive barking and damage to the properties. It is important to note that proper training works best with proper exercising which helps burning the energy, which further leads to a more tempered behavior. The Welsh terriers prefer older children, as they aren’t quite best friends of the younger ones. If bred as pets only, grooming requirements are rather low. They need weekly combing and occasional baths, along with a few clipping sessions during a year. If bred for shows, they will need to be groomed more carefully. The Poodles are the meeting point for a sharp intelligence and an excellent sense of humor and this combination is entertaining for their families. Poodles are excellent family dogs, being in general in good moods and acting happy. They are very energetic and grooming is a must when it comes to their curly coats. Poodles come in three configurations: standard, toy and miniature. When referring to the sense of humor of a Poodle, it’s not a wild thing to link them to the Three Stooges. This is a positive thing, given the fact that this dog was the target for a lot of jokes in time. 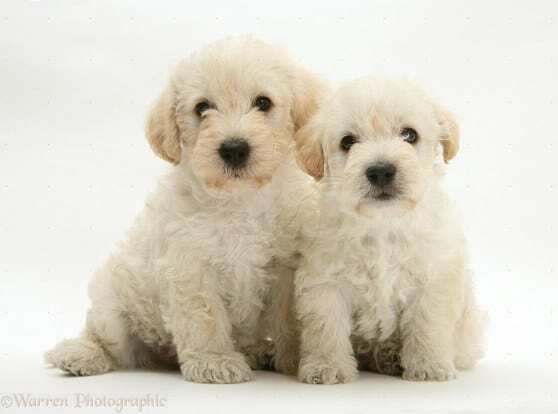 However, true Poodle lovers don’t forget that beside this aspect, the Poodle is a very intelligent dog, easy to train and very fond of the family who owns him. Regarding the coat, there are both good and a bad thing. The good thing is that Poodles shed very little, making them suitable for people with allergies, while the bad thing is that most people wrongfully see it as a challenge to maintain, because of what they see in shows and contests, where the Poodles have tuned-up looks and nail polish. All that make-up and hair styling is not necessary and, even more, not practical when kept only as pets. Grooming for Poodles is required at four to six weeks intervals and it can be carried out both by the owners and professional groomers. No matter the person doing it, the curly coat of a Poodle needs proper care in order not to allow the occurrence of mats and infections at skin level. The color range of a Poodle’s coat is quite wide, including black, red, apricot, beige, blue, silver, brown, white, gray, cream and a few others. Resembling to Doberman Pinscher and their points, the Phantom poodles present certain tan areas. There is a group that was founded with the purpose of moving the focus from the appearance of the Poodles to their abilities and personality, called Versatility in Poodles. With its help, Poodles can now enter the records of the American Kennel Club, so that they obtain work certificates and get the chance to enroll in hunting tests, along with other breeds such as Golden and Labrador Retrievers. Even if most people won’t be willing or interested in registering their Poodles in contests, Poodles have what it takes to do a lot of activities, especially that they are highly trainable and get along pretty well most times with other pets, as well as being tolerant with strangers. Agility and obedience are the areas where the Poodles can really excel, using their attention and learning as the main tools. While the Toy Poodles, smaller in size, are a bit reluctant to playing with children, the Miniature and Standard poodles, fairer in size (over 25 centimeters tall), will be open to and enjoy activities and playing with them. Standard Poodles, being bigger, will need more exercise in order not to get bored and inflict damage on the surroundings.